Rosemary Essential Oil Keeps you Focused and on Target! Rosemary Essential Oil as one of the most broadly used plants throughout the ages. It still can be used for numerous applications including uplifting the mind and bringing mental clarity. I like to smell or diffuse it when I am mentally need a pick up especially when I am tired and still have a bit of work to do! Especially computer work! My favorite professionally made blends that contain Rosemary are Clarity Melrose, Purification and Thieves blends. And I use them daily at home and at the barn with the horses. PS It also is very common for Rosemary oil to be adulterated. So make sure you know your source, and chemotype (see below). This section is a fun and easy reference guide for Rosemary Essential Oil. It will tell you how to use it and what to use it for. It will also provide you with some fun suggestions, safety precautions for you and your pet! As I receive new tips and testimonials for Rosemary they will be added to the page, so check back frequently! Want to Purchase Therapeutic Rosemary Essential Oil? 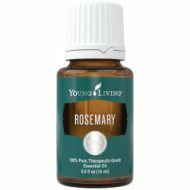 Buy Rosemary Essential Oil Here! Rosmarinus officinalis CT camphor – This plant is extremely high in camphor. Is considered a powerful energy supporter. Grown in Spain and Croatia. Rosmarinus officinalis CT 1, 8 cineol - This plant includes naturally occurring constituents eucalyptol and alpha-pinene and is the subject of this website. Grown in Morocco and Tunisia. Rosmarinus officinalis CT verbenon – This is considered the most gentle of the chemotypes. Grown in Corsica. What are the Documented Uses for Rosemary? Uplift mental fatigue and promotes mental focus. What is the Aromatic Affect on the Mind? Keeps the mind alert and focused. Strong aromatic scent of herbs and wood. What is the Spiritual Influence? Walking in your truth by being faithful to your self and your own destiny or purpose. Even the Greeks and Romans used it to understand loyalty. Loyalty to self before others. When we are more loving and loyal to others rather than to ourselves our energy becomes stagnant and cloudy (resulting in poor circulation and/or concentration). This is why this oil is connected to our heart energy. What Chakra is Affected? Opens the heart chakras by promoting circulation of Qi energy and blood. Interested in Dietary Rosemary Oil for Your Culinary Adventures? Then check out Rosemary Vitality Essential Oil! All of the professionally made blends I mentioned in the introduction, I use at the barn everyday with the horses and I highly recommend them. Just click on the link to find out how I use them! Go to the Oil Shop! Buy Rosemary Oil Here! Diffuse or make a spray of Rosemary, Peppermint and Lemon to use to uplift the work environment and promote collaborative energy!